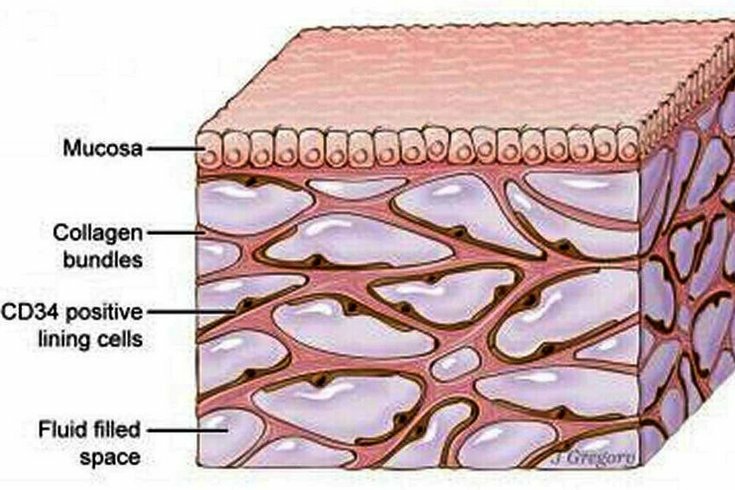 "Interstitium" is composed of two connective tissue proteins – collagen and elastin. This schematic of the fluid-filled space supported by a network of collagen bundles lined on one side with cells. Researchers from Penn have helped discover a previously unknown feature of the human body. The discovery could have implications for the function of most organs and may play a role in the mechanism of many major diseases, according to the team, which also included researchers from Mount Sinai Beth Israel Medical Center and the New York University School of Medicine. It also could prove to be important to understanding the spread of cancer cells. According to a research team at Penn's Perelman School of Medicine, it found a system of interconnected, fluid-filled compartments in several places in the body – below the skin’s surface; lining the digestive tract, lungs and urinary systems; and around arteries, veins, and the space between muscles. Previously unknown, the "interstitium" may be a shock absorber for many organs and tissues. It was described in Scientific Reports this week. The researchers believe these spaces are an extension of the interstitial space between organs, supported by a strong and flexible network of collagen and elastin, two connective tissue proteins. According to Dr. Rebecca Wells, co-first author of the study and a professor of gastroenterology, bioengineering, and pathology and laboratory medicine at Penn, they found the interstitium is composed of these two proteins by examining human bile ducts. The team hypothesizes that the fluid serves as a shock absorber because the places where it is found experience differing types of movement. Wells and her colleagues are working on identifying the cells that adhere to the collagen bundles as these cells may be important for understanding some forms of fibrosis. The research was funded in part by the National Institutes of Health and the NSF Center for Engineering MechanoBiology.